This node is created by the Knife shelf tool. You can use it to interactively draw a line to divide, delete, or group geometry. Select the object you want to to divide or clip. Click the Knife tool on the Polygon tab of the shelf. Drag a line to specify the plane along which to divide/clip. You can use snapping to constrain the line. 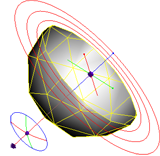 After you drag the line, a handle appears in the viewport representing the plane. You can drag the handle to refine the plane position and orientation. Keep: All primitives divides any polygons intersecting the plane. Keep: Primitives above the plane and Primitives below the plane delete all geometry on one side of the plane. You can draw knife lines around the edges of the viewport to manually delete polygons outside the field of view to reduce scene complexity. Geometry group or subset of primitives to operate on. When this parameter is blank, the node operates on all input geometry. 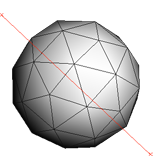 Divides primitives (polygon faces) that intersect the plane. Deletes all geometry on one side of the plane. Origin of the clipping plane. Distance of clipping plane from the origin. You can use this parameter to move the plane "up" and "down" without using the handle. When Keep is All primitives, puts the two resulting partitions into named groups for later operations.